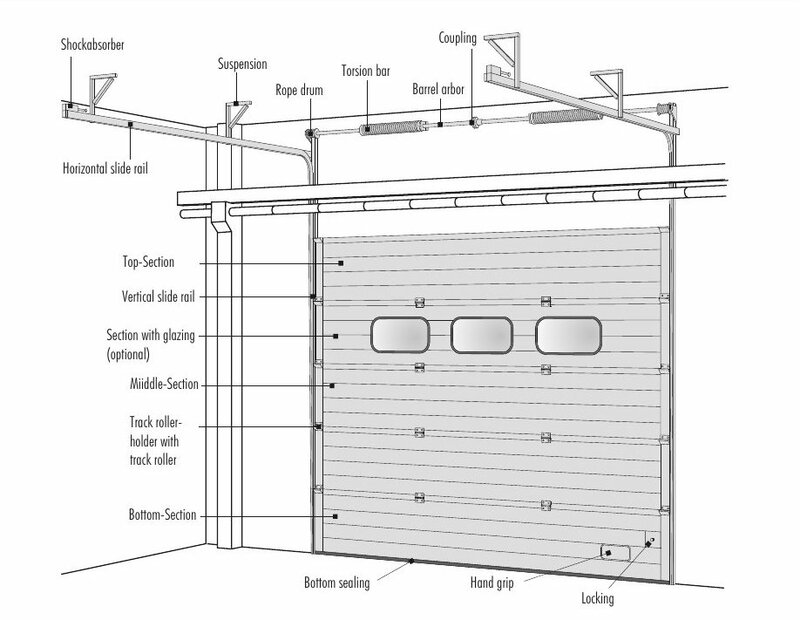 High-Led Fitting Sectional Door (HL) for high stroke over crane rails or similar mechanisms. The High-Led Fitting Sectional Door (HL) is used with large fall heights. When opening the door, the door sections are led above the fall and over a tubing or a crane track and returned afterwards into the horizontal one, so that they are placed in the opened status under the cover. The door is suitable for an easy manual control. The torsion bars needed for balancing the door page are non-standard calculated and manufactured on most modern feather/spring machines. The sectional doors are manufactured non-standard for each door opening from formed aluminum or galvanized steel sheet. High-isolating FCKW free polyurethan-foam, which creates the chemical network between front and back sheet, makes the section doubly self-supporting. The number of window sections can be varied as required – also combination and placing can be determined individually. As door with an electric drive it corresponds to the safety regulations of the professional association, the “Guidelines for strength-operated windows, doors and gates” after ZH 1/494, always in the newest case version.